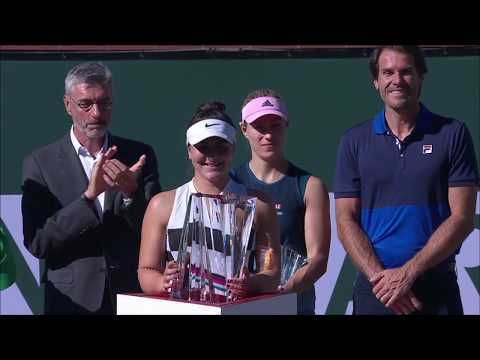 It has been a sensational start to the 2019 tennis season for Bianca Andreescu. The 18-year-old from Mississauga, Ont., is 18-2 overall so far and has reached a WTA final (Auckland) and won her biggest title to date (Newport Beach). She also qualified and won her first Grand Slam main-draw match at the Australian Open and led Canada, with her two singles wins in the Netherlands last weekend, into a Fed Cup World Group Playoff April 20-21 away against the Czech Republic. Her jump from No. 178 to No. 70 in the WTA rankings in 2019 means she’s now the Canadian No. 1 – 10 spots ahead of Genie Bouchard at No. 80. On the subject of Bouchard, Andreescu at No. 70 is well ahead of where Bouchard was at the same age in October, 2012, when the Montrealer was ranked about No. 165. That may be unnecessary pressure and Canadians have Bouchard, who reached the 2014 Wimbledon final at age 20 and a career best ranking of No. 5 that same year, as a cautionary example. But El Tabakh is not alone, the highly-respected and experienced Louis Borfiga, Tennis Canada vice-president for high performance athlete development, has expressed similar sentiments. Winning the Fed Cup would be remarkable accomplishment, and just expressing that thought shows Andreescu does not lack for ambition. Next for Andreescu will be some training in Montreal followed by WTA events starting the week of February 25th in Acapulco and then onto Indian Wells, Miami and Charleston. There were four possibilities for the Canadian Fed Cup team’s opponent in the World Group Playoff ties to be held April 20-21. The location for three of the four was to be decided by a draw, and the fourth was the Czechs in the Czech Republic because the two nations last played in 2015 in Quebec City with the visitors winning for the sixth time in as many meetings. When the draw was done earlier on Tuesday at ITF Headquarters in London, the first name drawn out of the Fed Cup trophy by president David Haggerty to play the No. 1-seeded Czech Republic was…Canada. As mentioned, the other three options – the U.S.A., Germany and Belgium – would have been 50-50 propositions in terms of the location for the Playoff. Last weekend the Czechs were beaten 3-2 playing at home in Ostrava by Romania as Simona Halep defeated Karolina Pliskova 6-4, 5-7, 6-4 in the third match and then the pairing of Irina-Camelia Begu and the highly-unconventional Monica Niculescu upset the world No. 1 doubles team, Barbora Krejcikova and Katerina Siniakova, 7-6(2), 4-6, 6-4 to propel Romania into the World Group semi-finals against France the weekend of April 20-21. That left the 10-time champion Czechs out of the 2019 running and into the World Group Playoffs in April. Looking ahead and speculating, the heavy-hitting Czechs would probably be best playing on a hard court surface with their two top players being No. 2-ranked Petra Kvitova and No. 5 Pliskova. But the issue might be that they could be playing the WTA Premier indoor clay event in Stuttgart the following week (both Kvitova and Pliskova are early entries) and would prefer not to have to change surfaces from hard court to clay in just a couple of days. The current two top-ranked Canadians, No. 70 Bianca Andreescu and No. 80 Genie Bouchard, are both comfortable on clay – as well as hard courts – so it will be an interesting surface decision by the Czechs. Following the Davis Cup qualifier triumph two weeks ago in Bratislava, the top Canadian men are now back in action full-force on the ATP Tour. On Tuesday, Milos Raonic advanced to the second round of the ATP 500 event in Rotterdam with a 7-6(8), 7-5 win over No. 32-ranked Philipp Kohlschreiber. In the second round the 4th-seeded Raonic will play Stan Wawrinka. Now ranked No. 68, the 33-year-old Swiss holds the 4-3 head-to-head advantage but Raonic won their last meeting – 6-7(4), 7-6(6), 7-6(11), 7-6(5) in the second round of the Australian Open last month. Denis Shapovalov, seeded 10th, is also into the second round after a 7-5, 6-3 win over qualifier Franko Skugor and next plays wild card Tomas Berdych, now ranked No. 59. Should Raonic and Shapovalov win their second-round matches they would meet in Friday’s quarter-finals. Television coverage in Canada is available on TSN3 and TSN2 as well as RDS2 for the rest of the event. A comment on the ABN AMRO tournament – the green court is okay but the interior green should be much darker. It would make seeing the ball a lot easier. Further north at the New York Open ATP 250 event, No. 118 Peter Polansky plays No. 92 Ryan Harrison in the first round and the main draw also features an all-Canadian opening round between No. 154-ranked Brayden Schnur, a qualifier, and Jack Mingjie Lin, a 19-year-old wild card who has no ranking. Both matches are Tuesday at the Nassau Veterans Memorial Coliseum on Long Island. Vasek Pospisil, out of action since a back surgery last month, has seen his ranking drop to No. 101. It appears likely he will remain off the tour until early May – six months – when he will become eligible to return with an injury-protected ranking. On the WTA tour, No. 80 Genie Bouchard was beaten in the first round of qualifying for this week’s WTA Premier event in Qatar – losing 5-7, 6-3, 6-4 to No. 97-ranked Madison Brengle. This cheery pair greeted spectators as they arrived for the Fed Cup first round tie in ’s-Hertogenbosch last weekend. Unfortunately, they were destined to be disappointed by what turned out to be a relatively one-sided 4-0 victory for the visiting Canadians.